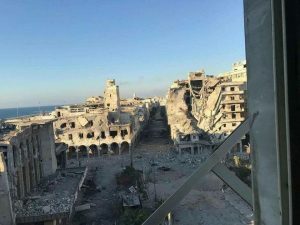 It might need up to LD 10 billion to rebuild Benghazi, which would mean major help from central government since the sum was way beyond local fund-raising, says a leading academic. Benghazi university economics don Attiyah Fitouri, writing in Al-Wasat, said he believed that the minimum cost of rebuilding the ravaged areas of the city would be LD 5 billion. Libya could afford the LD 10 billion he said, because of its foreign currency reserves. He also said that the reopening of Benina airport would assist with the movement of the foreign companies and technicians that are needed in the reconstruction. But for some the return to full operations cannot wait. Brega Marketing has begun extensive work on its Ras-Elmungar gas distribution terminal to the east of the city. It was not damaged in the recent fighting but has long been in need of an upgrade and expansion. The job includes new gas tanks and a bottling plant. In January 2016 Brega opened a tender for two new tanks and a fire suppression system. It is not clear who won the contracts. This June the new board of the wholly-owned National Oil Corporation subsidiary announced ambitious new expansion plans though it has yet to announce how they will be financed. Meanwhile Benghazi Port Authority is completing a survey of what needs to be done to bring the port back into full operation after fighting raged around it for the best part of three years.